Happy 2017, pals! After the craziness of Vegan MoFo in November, I went 100% radio silent in December. What can I say? The holidays are always so busy, and since November was a mad rush of cooking, baking, recipe-writing, photographing, and blogging, I was pretty much spent when it ended. Let’s just call it a hiatus and move on! I nearly always enter a new year with a few weeks of vegan cookie binging behind me, ready to incorporate just a little more good green food into my diet. It’s not that I don’t eat healthy foods during the holidays (I think I’ve eaten my weight in clementines in the past month! ), but I tend to also eat lots of baked goods and indulgences. January seems like a natural time to re-calibrate and reset my eating patterns. Is it a resolution? Nah, just an intention to include more nourishing ingredients in my meals. So in that spirit, today I bring you some simple oven-baked veggie patties, inspired by the sweet potato and mung bean croquettes I made a few years back. 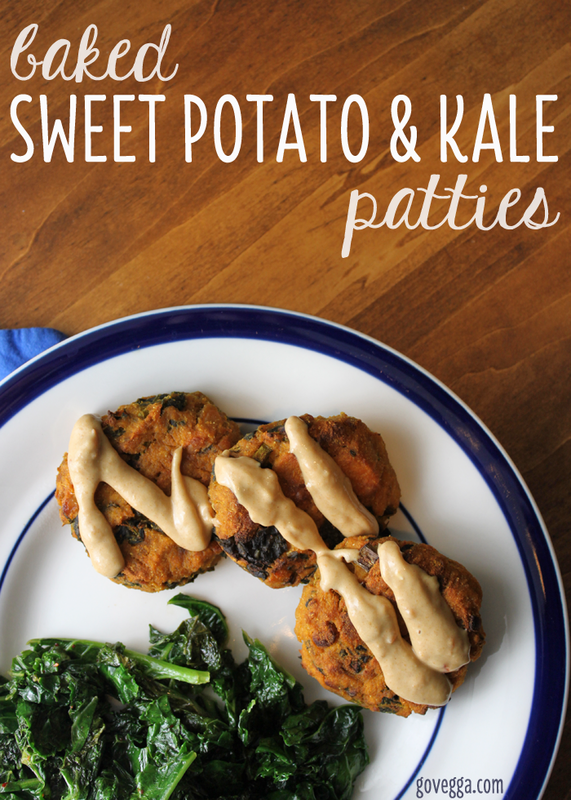 This recipe again features sweet potatoes as a base, but it also incorporates a handful of steamed kale and some crumbled tempeh for extra protein. I kept the flavors simple — fresh ginger, soy sauce, and curry powder — but you can add whatever spices appeal to you. The final step (brushing the patties with melted coconut oil and broiling for a few minutes) adds a little crunch and some extra flavor, but it’s totally optional; feel free to omit it if you’re cutting down on added fats. Begin by steaming the tempeh and the chopped sweet potatoes for about 15 minutes, or until the sweet potatoes are fork tender. While they’re steaming, you can finely chop the kale and slice the scallions. Set both aside. When the potatoes are done, add them and the tempeh to a large mixing bowl. Let them cool slightly while you steam the kale just until soft, about 3 minutes. Preheat oven to 400˚F and spray a baking sheet with oil (or line with parchment paper). Using a wooden spoon, mash the sweet potatoes and tempeh mixture. Add the scallions, ginger, coconut flour, soy sauce, curry powder, and kale, and mix thoroughly. Then use your hands to form about 1/4 cup of the mixture into patties about 2″ across and 3/4″ thick; you should have enough of the mixture to make 12 patties. Place on the prepared sheet. Bake for 30 minutes, then brush the patties with the melted coconut oil and broil for 5 minutes, just until they start to brown. Remove from oven and let cool slightly. These soft fork-tender patties are best eaten drizzled with your favorite sauce, alongside a big helping of veggies. 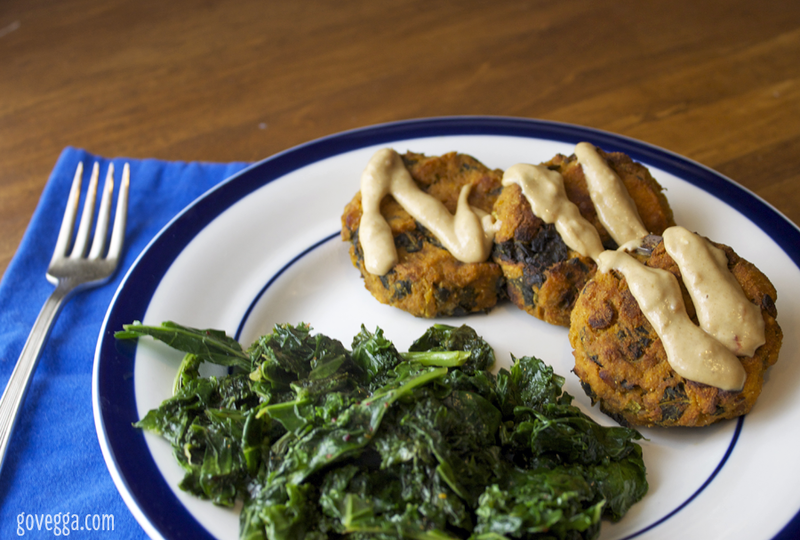 You could try this peanutty coconut sauce or this similar curried version.